Well said major sahib our nation never wake up.God only save our soldiers if he is alive. They dont care...keep writing..will fall on dumb ears...guarenteed. Why are we so gullible and emotional morons .. If countries safety, welfare and progress is fauj responsibilities .. then why are we forgotten when its time for reward and happiness ? With this war mongering and raising public hysteria ,the executive and political pillars are trying to divert and absolve themselves from their primary responsibility of a civil & political solution. For last 68 yrs they have used the fauj as cannon fodders in Kashmir and whole of North East. In Srilanka too this political-bureaucratic establishment mafia used the fauj like tissue paper and the end result were body bags and widows with their family dumped. They want country to be defended with the lives of other people’s children and that too cheaply possibly as cannon fodders. In 1971 Bangladesh liberation war the same deceit was played and in return prize was degradation of services further and pension reduction. Fauj is fed on Ram , Ration and Rum ... Chadh-ja beta suli per , bhali karega raam. I want to garland YOU Sir,how many thick heads will be able to understand you.I pity all those ignorant people.But ignorance is bliss again. Yes certainly, But is it the duty of the public or he govt? 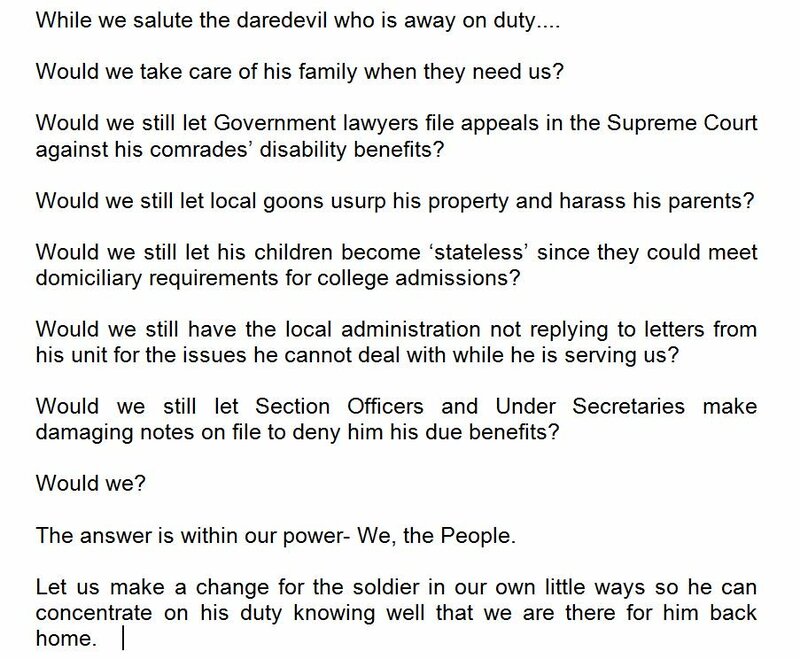 Any way govt has already planned for the same by collecting one rupee per head per day for the welfare of the disabled and killed jawans.What a fantastic work by the b/c?So far they were making profit for the govt by cutting jawans pay and pen for increasing their pay and pen with out losing money from the fin dept. now they are aiming the public also. This will only happen if no one joins the armed forces,because in one TV debate one bureaucrat clearly said "joining the Forces is voluntary so why are you grumbling"if this is in their minds can you expect justice..
the spot has achieved the degree of fast informative by recent time gud going keep it up. Hope Maj Navdeep post is issued as commandment by the Sovereign. Hope OROP is understood and grievances are redressed. These questions were asked many times in the past, the government, and the people of India always felt that the soldiers opted for this call of arduous duty of 'ensuring the security of the nation' fully knowing that such sacrifices, ignonimities are their way of life. Nothing will come out of your plea. Only the thankless set of Babus in general and MOD Babus in particular and the political leadership with the mindset of that of Arun Jaitley are the negative factors. Indians, in general, are not thankless and have always admired and stood by the soldiers but their sentiments are not enough for the fair treatment to be accorded by the government. What is BROADBANDING of disability. I did not understand. If someone clarify on the subject. What's the point of lamenting and showing oneself as victims. In this country no one gets his rights without asserting oneself.These netas are there only to look after their own intetests..not for Desh sewa.One Modi does not make any difference. And even Modi is more concerned about his political fortunes than that of the fauji. He would rather listen to the Babu who is by his side 24 x 7 than the fauji. These people only listen when it becomes a question of their political fortunes. Sentiments have no place in their scheme of things. So, we need to go beyond these sentimental outpourings and get ready for real action- become politically relevant by putting pressure on these self serving politicians through a Anna Hazare type completely non political movement. And thereby restore not just the status of the fauji but also focus on so many problems plaguing our great nation. But the key to success would be remaining non political and functioning completely within the democratic framework, keeping the interest of the nation always above everything else.